Marriage is on my mind these days. You see I have a daughter who is embarking on this journey and I'm happy for her. There's a lot of information online today regarding this holiest and most sacred of relationships and all of it is not relevant advice. As a matter of fact, if you pay too much attention to what everyone is saying without knowing yourself, God's view of marriage, and having a confidence from being a worthwhile child of the King, you will be confused. I've heard a wedding is a day but a marriage is for a lifetime - and while this is true it doesn't negate the beauty or the planning that goes into the day. Prioritize what is important but know that your wedding day can be just as important as ensuring you have a healthy marriage. I've heard as the bride it's your day so you can do whatever you want. Here's a reality check: it IS your day but you CANNOT do whatever you want. 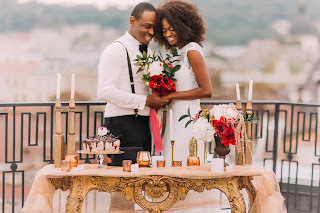 In no other area of life is it true that you can do whatever you want without ramifications; this rule does not take a break on your wedding day or as you plan your wedding. So as a wise bride, display what is in Ephesians 4:32. I've seen whole posts validating the amount spent to plan a wedding. Again, be wise and spend what you want and can afford. If $425.00 makes sense for you then do that. If you want to do more and you can without over-extending yourself, then do so. Everything in life costs - so weigh the cost. I've seen chatter about making sure the groom can spiritually lead - that's a huge weight that was not intended to be burdensome. This spiritual leading will be an outgrowth of his own spiritual life. Though married, in Christ we are all each responsible for our own walk. Yes, it's great if, from day one, each person possesses the appropriate level of spiritual maturity - but maturity, spiritual and otherwise comes through experience. As Christians, we are all being molded and changed by His grace into something resembling Godly character here on earth. Both the bride and groom should have a heart for the things of God - this is a good place to start. As someone whose married a long time, I've wanted for my children what I have experienced in mine (most of the time): the beauty of oneness, the sweetness of support, the ease of communication, a vulnerability that's not rejected, the shared enjoyment of new experiences. I said most of the time because there are times when the person closest to you can make you the angriest. Or knows your buttons so they can push them to the point of irritation. It is also in these moments when you learn the essential nature of forgiveness, the return, the rest, the quietness and the confidence. And yet in Ephesians, marriage is used as a metaphor for our relationship with Christ and His with us - this is the profound mystery. He uses what we know to give us a representation of who we are to Him. Though a sacred relationship in which we as Christ's bride are treasured; within this relationship, we will have tribulations, it won't all be peace and joy. But we don't quit because He is there with us. He doesn't quit on us. He never leaves or forsakes us. This is indeed a mystery encapsulated in love. Someone loved us to the point of death. Someone extends grace and mercy no matter how much we mess up and this rightly humbles us. For this cause shall a man leave his father and mother and shall be joined unto his wife, and they two shall be one flesh. The planning, the big day, are all peripheral to the relationship. The spiritual leadership by the groom will come over time especially if he is desirous. Life will instill the beauty and reinforce the picture that's painted in Ephesians. Submission to God is humbling. Submission to each other is humbling. Marriage is humbling. I wish the best for my daughter as she embarks on this new journey. Wow, so insightful! Thank you for your wise words. Congrats to your daughter! Nylse, this is certainly an exciting time for your family, especially your daughter. I pray all the wedding planning goes well but more so I wish her blessings as she embarks on this amazing journey. With your words of wisdom and God to guide her, she'll be off to a great start. Will share...since I have three daughters ! love you calm and wise approach. My youngest daughter got married last fall, so this is all still fresh for me. Love this: "Both the bride and groom should have a heart for the things of God - this is a good place to start." I'm grateful that was true for my kids! It makes a big difference to be able to start off a marriage this way. Blessings to you and your family as your daughter gets married and you gain a son! My oldest daughter is 11. I can't even begin to imagine her being old enough to marry. Your post has reminded me that the day is just around the corner and I need to start praying for her -- and all my children -- and their future spouses and marriages. Marriage is humbling and I also see it as a responsibility. You are tying your lot in life to someone else's and vice versa. If your daughter is anything like you she has the foundation for a strong marriage and you will have some good advice for her along the way. My kids aren't there yet but this is a great post full of wisdom. Thank you for being a voice of grace and truth in a world with much confusion and chaos, as you said. God bless! Love the wisdom here and the tips! God's blessings on your daughter's day and marriage! It's such an exciting time in your family! Thank you for sharing these very heartfelt thoughts. I've heard all of the quotes & sayings that you mentioned here, and I *love* your perspective on them with various Scriptures - thank you! The beauty of oneness...I truly believe that if you can continually keep this a priority, it is possible to work through even the most difficult of circumstances because this puts each of us in a place of laying down our life for the other. So excited for you! What a wondefully special time. I've not reached that with my 3 yet, but now that they are old enough, I feel myself so looking forward to this. Hi Nylse - it is all so humbling isn't it? Thanks for your insight - I am not there with my kids getting married just yet, but I so appreciate your words from a mom whose been there. thanks and Blessings and thanks for linking up with #TuneInThursday last week - hope to see you tomorrow.